at Oatlands Handmade for hand spinning, felting and dyeing. 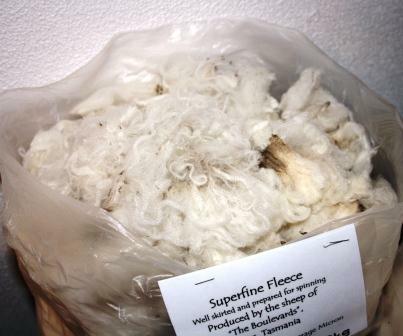 We have Superfine Tas Merino, English Leicester, Border Leicester, Mohair curls, Alpaca. In washed, greasy, dyed in the fleece. Full fleeces, fleece packs and by the gram. If you would like a price list or would like to buy some of our fleeces, please email or phone and we can send to you - washed fleece to anywhere - greasy only in Tasmania (although our fleeces are clean and prepared for you, this is due to quarantine matters re potential vegetable matter and soil content). 18.5 micron Superfine Tasmanian Merino Tops (or Rovings) always available in 20g, 50g and 100g packs. If you want more, we can make up a pack for you. (Soon to be available in hand dyed colours). For needle felters, spinners and felters also bling batts and balls, optim superwash rovings, specialty fibre mix batts and rolls, and Firestar to add bling and zing to your project. Come and see us - we're just an hour from Hobart or Launceston. We can send you samples and post to you anywhere!